Royal Kahana 713 - 1 Bed / 1 ba - Free Parking and WiFi - Great Ocean views! 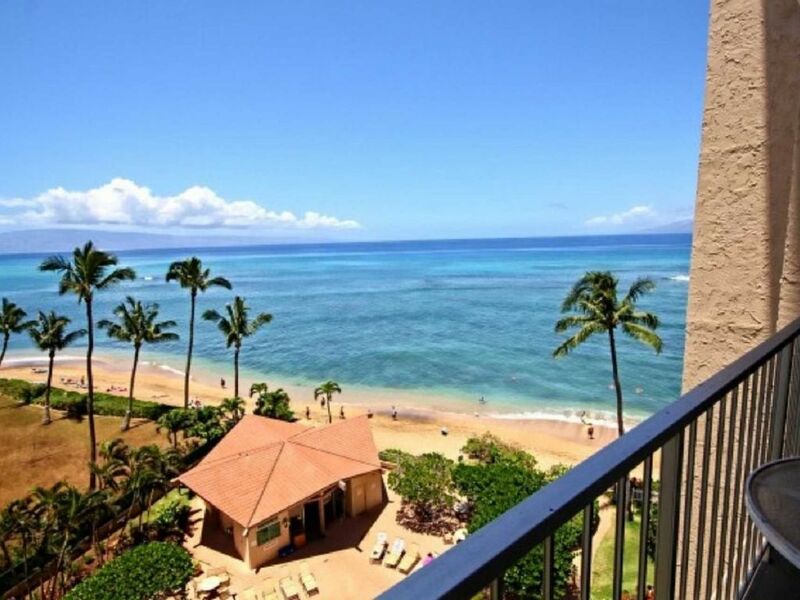 This one bedroom Royal Kahana 7th floor air-conditioned condominium is situated on a sandy beach between Ka'anapali and Kapalua and features fantastic ocean views from the living room & bedroom. Enjoy fabulous sunsets from your oceanfront lanai while gazing out at the islands of Molokai & Lanai. All of the comforts of home await you at Royal Kahana 713. The bedroom is furnished with a king bed and a fantastic ocean view. There is a queen sleeper sofa in the living area which provides additional accommodation. A fully equipped kitchen, washer/dryer, TV, Blue Ray DVD and air conditioning will add to your comfort. The ocean view lanai with its exposure to our gentile trade winds afford the perfect place to enjoy your morning coffee or a restful afternoon read. The Royal Kahana Resort boasts of enduring guest satisfaction—providing the peace and tranquility in the true spirit of “aloha”. While there you will enjoy complimentary WiFi, guest parking, a heated swimming pool, shuffleboard, ping-pong, and gas grills. The resort is a “no smoking” facility except in the designate smoking area. We had a great time at the condo. Beautiful sunsets from the ocean view lanai. The only disappointment was that there was no beach due to erosion, so we had to drive to a nearby beach. Loved the proximity to the Maui Brewing Company tasting room. The condo was great, nice and clean with great views. We were able to see the whales breaching from the lanai. We knew the beach was seasonal so there was no sand. There is a decent beach with in a 5 min walk. It would have been nice to have been warned that there was going to be construction going on for several days. They were putting in giant sand bags at the waters edge for erosion control so there was no access to the water. The staff at the Royal Kahana were friendly and it is a short walk to the Maui Brewing Co. This condo had amazing water views. Whale sightings all day every day and the sunsets were breathtaking. Mahalo Sherri for the wonderful review. We are so pleased you enjoyed the views, the sunsets and were able to see the whales daily. As many people have said, the view was amazing. It was on the 7th floor which made the view remarkable. We had a wonderful time. However, there are some things that assure we will never stay in this condo again. IT IS NOT ACCESSABLE!! The doorways were so narrow that my walker would not fit thru in one spot. Also it was so narrow into the bathroom its not ok for anyone who is overweight. The furniture was wicker. The only comfortable place to sit was the couch. And there was no place to put a suitcase except the floor because all the surfaces were glass. I used the counter in the kitchen because we did not use the kitchen. And the condo was individually owned so we had no use of the small front desk. And there was no restaurant within the condo as many others have! We walked thru another condo to get to Dukes restaurant. There was free valet parking and a large welcoming front desk. Not so here. I called the property manager a couple times with concerns and they were very kind. But they were off site! This is the best place to stay! The first thing we saw when we opened the door was an amazing ocean view from the back door. It is literally right on the beach. There is a great little kitchen with everything you need to make a meal. It was so nice to have a washer/dryer to wash our towels and swimwear. There is easy access to the ocean, and a great pool to lounge by. Our favorite feature was that it was less than 10 minutes to Kaanapali and Kapalua. Close enough to Lahaina, without all the busy streets. If you are going to Maui, skip the resorts. This room is the gem of the island! Major Credit Cards Accepted. A 35% deposit is required upon confirmation of all reservations. A $44 limited damage waiver will be applied to all bookings in lieu of a security deposit. Local, State & Federal Taxes 14.416%. Processing Fee $35 per trip. 10% OFF- Fall-Last Minute Booking Promo-booked within 14 days of checkin.